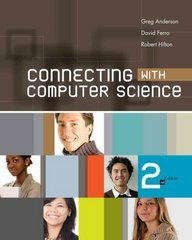 Connecting with Computer Science 2 Edition Written for the beginning computing student, this text engages readers by relating core computer science topics to their industry application. The book is written in a comfortable, informal manner, and light humor is used throughout the text to maintain interest and enhance learning. All chapters contain a multitude of exercises, quizzes, and other opportunities for skill application.